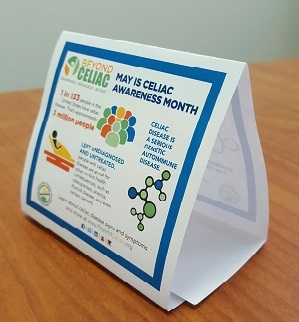 May is Celiac Awareness Month, but we can work together to make people aware of celiac disease all year long. Now there's an easy way to raise awareness in your restaurants, schools, cafeterias - anywhere! Download this PDF. Adjust your print size to 18" x 12" and be sure to print on the same sized paper. The PDF has been designed to fit on a pre-fab table tent, like the one featured here. If you do not have pre-fab table tents or if your printer cannot print to the specified size, you'll want to follow this option. Download this PDF. In your print screen, select the option that says "fit to scale." Simply print, cut vertically between the infographics to separate. Fold each half into a triangle so that it stands on its own. Cardstock paper will work better than standard computer paper. Secure the bottom with tape. See the photo to the right for an example. Use the infographic as a flier instead of a table tent. Download this PDF to print an 8 1/2" x 11" flier to hang up in your establishment. Contact Janet Lynn with any questions at jlynn@beyondceliac.org or 267-419-2104.